You won’t solve the problem with an air freshener was the first solo exhibition in Vancouver by Montréal-based artist Dominique Pétrin that I curated for grunt gallery in 2017. 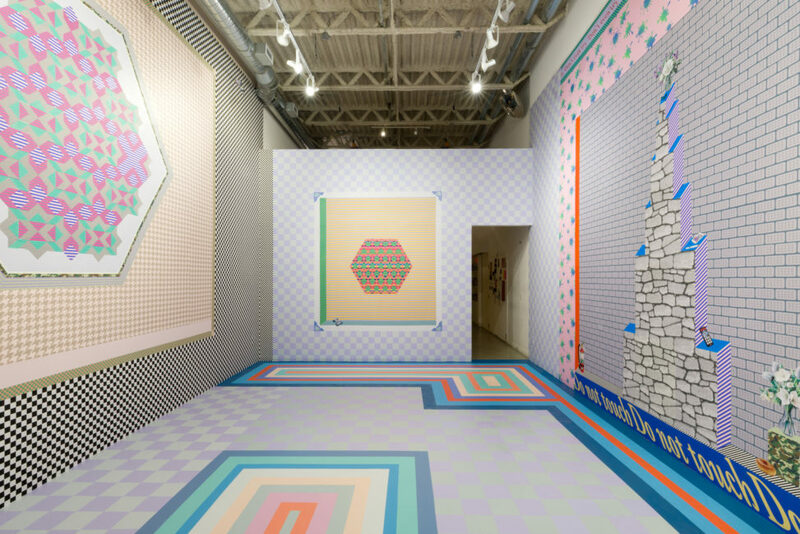 The exhibition was composed of silkscreened paper created on-site and pasted to the gallery walls by the artist as an immersive installation that reflects both the architecture of the gallery space and her prolific and extensive screen printing practice. Building layers of geometric shapes and colours, Pétrin’s “maximal” (as opposed to minimal!) works encompass entire rooms and gallery spaces and through a seemingly endless proliferation of digital imagery. A former member of the petrochemical rock band Les Georges Leningrad from 2000-2007, Pétrin has collaborated with artists such as Banksy, Sophie Calle, the Pil & Galia Kollectiv and choreographers Antonija Livingstone, Stephen Thompson and Jennifer Lacey. Her work has been exhibited across Canada, France, the United States, Belgium and the United Kingdom. In 2014 she was longlisted for the Sobey Award. You won’t solve the problem with an air freshener ran from October 27 to December 9, 2017. A text on the show can be found on the grunt website. Dominique is a dream to work with. More can be found here.